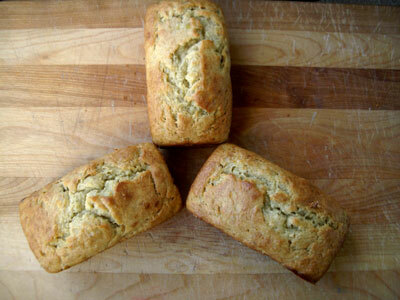 Well, maybe not a better banana bread, but different banana bread: cakier, creamier, moister. I, personally, think I prefer this loaf to the previous banana bread recipe I posted, but my wife makes the point that this recipe produces a much more delicate bread than the previous one does. For a quiet cup of tea on a lazy summer afternoon, this is the one. For a picnic at the zoo with a rambunctious three year old, the previous one is the way to go: it'll survive the transport in the car and backpack much better. This is, in fact, the same recipe as before with a cup of vanilla yogurt added. The yogurt made the dough moister, so in response I needed to add more flour. Since I was adding more flour, I decided to try using some whole wheat flour. It turned out well. So if there is a lesson to be learned here, it isn't that this is the greatest banana bread in the world. It is to make each recipe your own. Bake often and do not be afraid to experiment. If you don't screw up a recipe from time-to-time you probably aren't baking enough! Use a potato masher, fork, or spoon to squish the banana and mix the ingredients together. It is alright for there to be small (1 centimeter) chunks of banana in the batter, but you want most of the banana to be reduced to mush. Combine the wet and dry ingredients and mix until the ingredients are blended together. If you like, stir in additional ingredients here, such as chopped walnuts or pecans, dried cherries or apricots, or chocolate chips. A handful (about a half a cup) is about right. Pour the dough into greased baking pans and bake until a toothpick inserted in the center comes out clean. Small loaves take around 30 minutes, a normal-sized loaf takes around 50 minutes. Remove from the oven. This bread is great warm, but it is excellent cold too. After they have cooled for 5 or 10 minutes the loaves can be removed from the pan to cool. Once they are cool they can be individually wrapped and frozen. Related Recipe: 10 Minute Banana Bread. Well I have 3 loaves in the oven and one waiting. I did change the original recipe a bit. the first loaf I didn't add any sugar,(I actually forgot,,,DOH!) subbed full fat buttermilk for the yogurt and used cracked wheat flour instead of the whole wheat. ( I found it in bulk at a Euro Market along with light and dark rye flour). the second and third loaf I added the sugar, subbed buttermilk for the yogurt and used cracked wheat flour instead of the whole wheat. For the 4th loaf I did the same as the 2nd and 3rd but added 1 teaspoon of vanilla extract to the wet ingredients. You say that the loaf looked perfect, but did you test it wth a toothpick in the center? The sinking is a sign of being undercooked. Sine you're using a glass pan, you can try lowering the temp to 325 and cooking it longer. When you test for doneness, the toothpick should come out almost clean, maybe a crumb or two will cling, but that's all. One more thought- are your baking powder and soda fresh? I have a recipe I have used for years in the past... and then forgot about banana bread. These posts make me want banana bread again. My recipeis from a lwo fat cooking book though didn't taste low fat. I have always frozen the bananas (peeled in feezer bags) just as they turn in their peels. This way you always have them on hand, and no need for grating cutting, they are somewhat mashed when they thaw...same exact flavor. Thanks so much for these recipes. I've been working on various banana bread recipes for quite a while (one of them is with cream cheese so I can't wait to try the one posted here!). It sounds like a great idea to use oatmeal - can't wait to try that one either or maybe combine them! Now I have another question - how do I start a new post here! I can't find the "button" to push to open a new one. Thank you--I like this recipe A LOT. It yielded the most "bread"-like quick bread I've ever made--e.g., it had bit of a crust! I never had banana bread before, because I don't like the name. But, we had so many bananas in the house I just had to make it. And how lucky I was to find you recipe. This is delicious banana cake. I don't know why people call it bread, there is no yeast or sourdough as needed in bread. It does have baking-powder and -soda; cake ingredients. I asked TFL what to do with leftover bananas and someone kindly posted a family recipe for sourcream banana bread. I adjusted it for added rum and roasted pecans (and replaced the oil with unsalted butter). Butter and flour bottom of Kugelhopf pan. Beat together sugar and butter. Add eggs, bananas, sour cream, rum and vanilla to butter/sugar and mix well. Pour wet ingredients into dry and mix just until moistened. Batter should be very thick, so adjust with added flour as necessary. Cool in Kugelhopf pan for 30 minutes, then invert onto a cake plate or the like. It's very moist; if covered, it'll last days on the counter and still be delicious. I tried this tonight and they are fab... thanks! As I was mixing the first bowl I realised I had no yoghurt. I carried on following the recipe while I thought of a substitute, then realised when they'd been in the oven for about 5 mins that I had totally forgotten - oops! 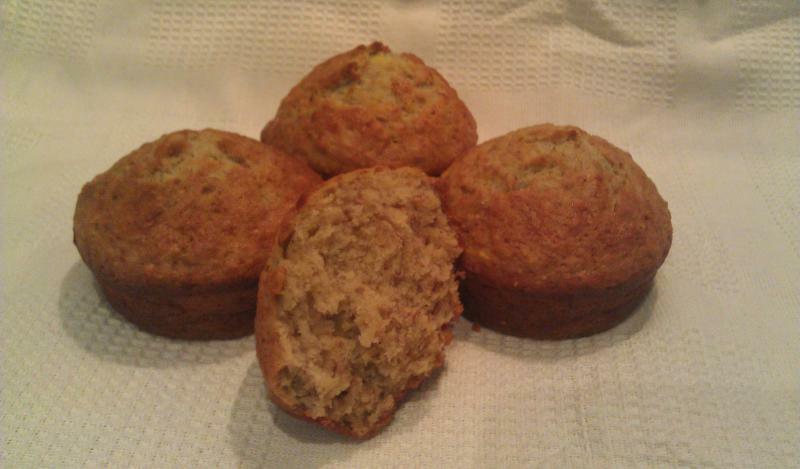 They are still quite moist having put three large and very ripe bananas into the mix, and they taste gorgeous. 3. Reducing the cooking time to about 20 to 25 minutes due to me making muffins rather than loaves. 1. Put a little more mixture into the tins to get a slightly larger muffin... I spread them too thinly to make use of all 12 large muffin tins, and really should have stuck to maybe 8. I always use this recipe for my banana bread. Yesterday I decided to double it, use only white whole wheat flour, plain greek yougurt, vanilla, and 6 bananas. It made 2 - 9x5 loaves. One was left plain and the other recieved a healthy heaping of chocolate chips. They took a little over an hour to bake, but well worth the wait. I feel lucky to have had a slice of both, because my husband and 4 kids devoured it in record time! thanks for this recipe it's very good and delicate with the yogurt. Hi, In the name of experimentation.... anyone try substituting persimmon puree for banana? I am thinking they are both sweet fruit purees, why not? I am going to try it but thought I'd ask, too.